The Department of Atomic Energy of India (DAE), a large organization with research infrastructure, production facilities and nuclear power plants in different parts of the country requires a strong network of communication to ensure perfect interaction and efficiency of its activities. The NKN network provides high connectivity and low latency needed to meet the growing demand for research in conjunction with institutes inside and outside India. For this reason, the DEA partnered with the National Knowledge Network (NKN) of India, and as is safe and fault-tolerant, part of the infrastructure of the NKN functions as the information superhighway own DAE. By creating this powerful connection, a collaborative medium that allows effective interaction between research units and 40 different development, both nationally and internationally established. It presents many advantages. For example, the network is used for collaborative design of a system more fast breeder reactors ( top image ). In this design process different teams of experts work in activities access to databases, computational resources, visualization tools latest technology for videoconferencing with different groups, therefore it is essential to have a broadband network. The NKN network also provides high – speed connectivity required to access mega scientific projects globally as the Large Hadron Collider at CERN, and the European Synchrotron Radiation Facility in Grenoble, France. DAE scientists have used the Synchrotron Light Lines FIP ( Line French Light for Protein Research, see image on the left ) for the crystallography of biological macromolecules. 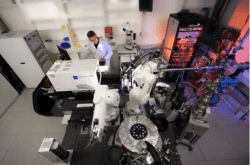 Beamline FIP operates fully automatically and has been enabled for remote access. By working in conjunction with continuous Grenoble, scientists at the Center Bhabha Atomic Research, Mumbai, collected data from single crystal diffraction X distance running beamline FIP rays. The research results can be used to determine the three dimensional structure of molecules through crystallography, which allows for studies of the structure-function relationship of biological macromolecules and develop new drugs. In addition, experts in High Energy Physics DAE also involved in the data analysis of large collider experiments at CERN. In short, both the DAE and for other research institutions in India, the national infrastructure of the NKN network provides high connectivity and low latency needed to meet the growing demand for research in conjunction with institutes inside and outside India.